ORIGINAL date Sunday April 25 2010. Cressida Bonas, who is currently dating Prince Harry can be seen in this group shot with Princess Beatrice and Richard Bransons son and daughter at the 2010 London Marathon. 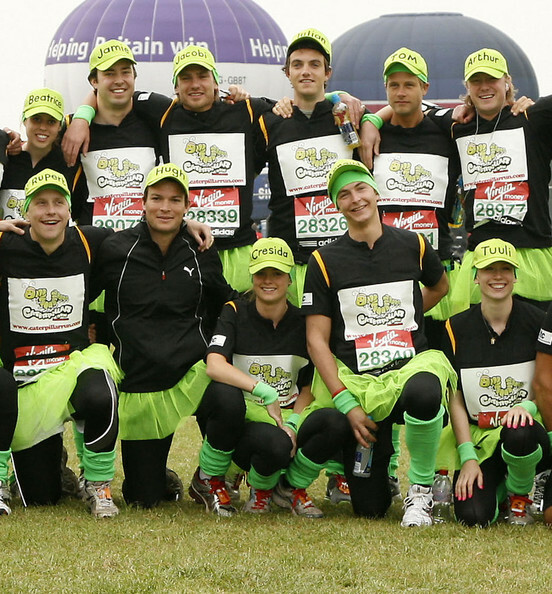 ORIGINAL CAPTION Team Caterpilar - which includes Princess Beatrice, her boyfriend Dave Clark and Sam and Holly Branson - join a host of celebrities, fun runners and professional athletes competing in the 30th London Marathon. "Team Caterpillar" are attempting the world record for the biggest number of people to finish a marathon tied together. They are running to raise money for several selected charities, including Princess Beatrice's mother Sarah Ferguson's chairty "Children in Crisis".